Here is an effective form of learning! The ability to laugh leads you to the process of learning. You get a new perspective and reflection through this book. Let it be a candle light for you in t he darkness of ignorance. There is no more any frustration and stress. You are no more learning English grammar! Instead you are living in it. The inspiring cartoons will take you to a new level of understanding. This highly effective book with a difference is submitted for a change! Let us welcome these rapid changes. my english is not good. I was able to improve english by reading this book. Very easy to understand and remember. Cartoons cover most of the pages so information is less. More pages should have been added. But the info given is nice and easy to read and understand. at just 60/-, all students should surely buy this book. This will help in talking fluently and without any mistakes. All should get this book. 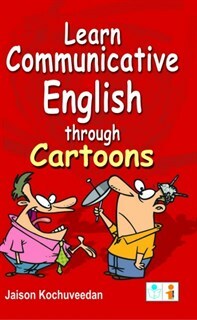 students who do not like the language english should get this book. They will like the language after seeing the cartoons.